I think it's a toy tugboat. I don't know what it is. It's in the video, but it doesn't seem to be what they set it beside. It's close in shape. I looked at that kind of figurines on Google images and there are a lot of them, but I didn't find one which was exactly like what's up on that cabinet. It looks like it's next to one of those old glass insulators the telephone company used which turn green after years of being in the sun. Maybe it's a sugar bowl with a lid??? Or a pirate's head, wearing a porkpie hat. As impressive as a day old turd sam. BTW, the first person to make this accusation on social media was ... Tomi Lahren. No, Tomi, I do not see what you see. It is NOT a pickaninny holding a piece of watermelon. You need to ease up on the hallucinogens. It's sitting on a shelf next to a bunch of teapots and other serving utensils. That gives me the image I need, one closer to being the original. It's got more pixels. It's a dark brown/light brown ceramic stoppered jar or bowl with a pair of wing handles. The kind of stoppered jar one might put sugar, honey, or molasses in to set on a table. The stopper is what looks like a head, it's big like a handle, it might have a spoon hung under it to ladle out what is kept in the jar. Tomi is older than she looks, worked for Hitler. 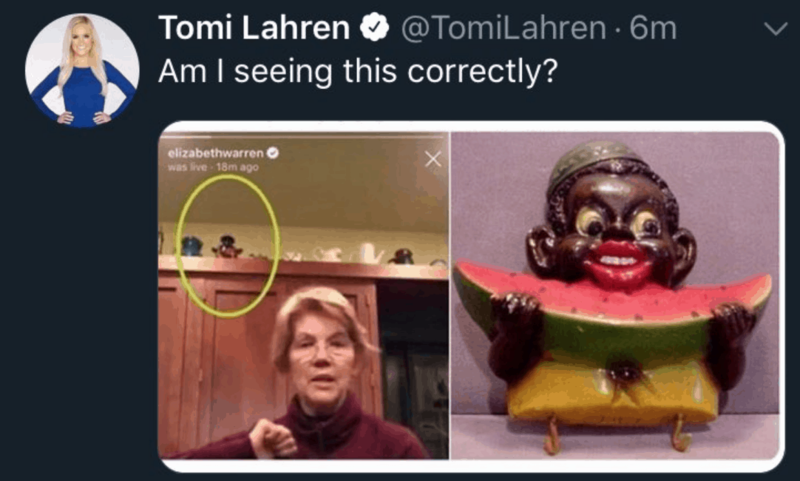 Does Elizabeth Warren Have a Piece of Racist Memorabilia on Her Kitchen Shelf? 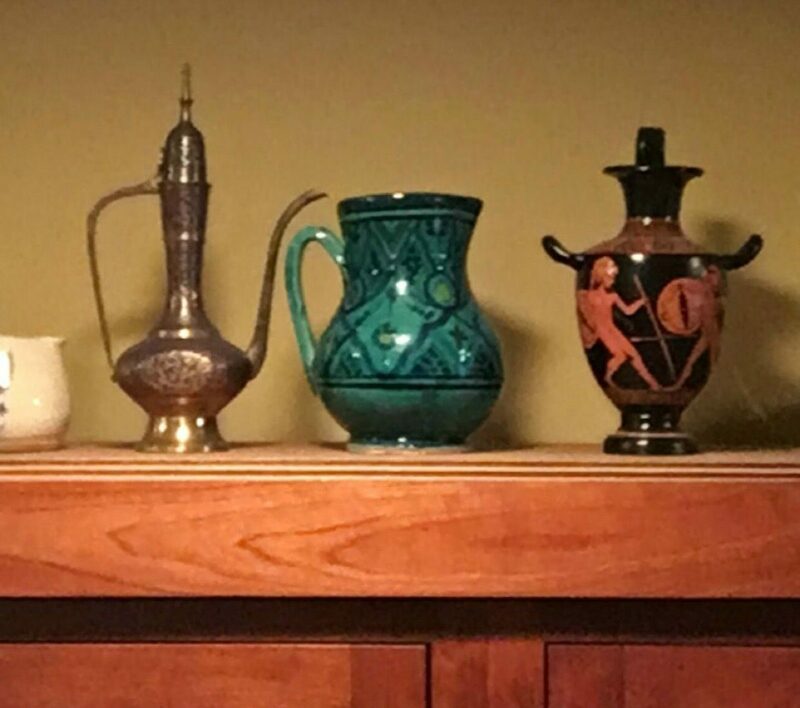 It's a black vase with Greek art on it. You can't see the whole thing because of the angle of the camera. I dont care if it is or it isnt, Warren wants to protect me from criminal corporations and I WONT HAVE IT if I have to give up my RACISM for it! Former Secretary of Housing and Urban Development Julian Castro has announced his candidacy. Mr. Castro was HUD Secretary under President Obama. He is also the former Mayor of San Antonio Texas. Congresswoman Tulsi Gabbard (D-HI) has announced she running as well. Ms. Gabbard is the Hindu-American elected to the House Representatives and served two tours of duty in the Middle East and is a Major in the National Guard. Dont the prof and CJ have a greatest hits list of reasons why Tulsi is NOT someone I would ever vote for? I know about the hatred of LGBT but there is other stuff. I only listed her because of her announcement. She has no business running. Hidden surface elimination rears its head again. The laws of perspective get misused regularly. Well, I'll focus on a few things. 2) Support for Hindu nationalism and Modi. 3) Support for Egyptian coup-master al-Sisi. 4) Steve Bannon suggested Trump meet with her to offer a Cabinet post. She was willing to take the meeting. 5) Frequently going on Faux News to criticize Obama. 6) She supported the Trump admin ban on Syrian refugees. Thanks, now at DU when the progressives rant and rave at us for opposing her we can explain why, I remembered some of this, there is more though. 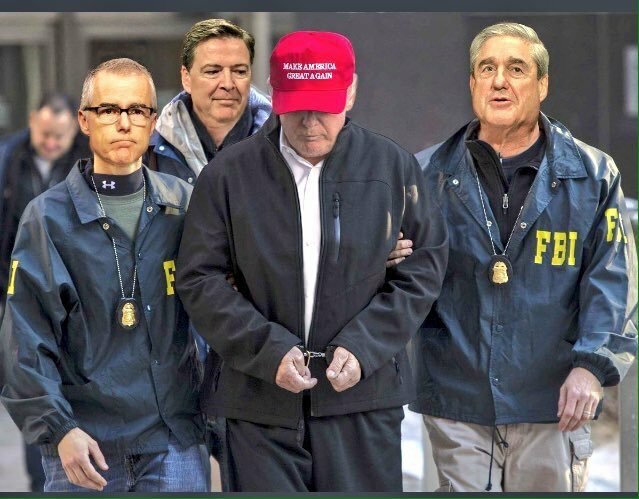 Personally, I want to focus on the news (which I told you all 3 years ago) that the FBI now agrees with Libertas, Rump is a spy. Opposing her by the way is meant in context of her running, I will oppose her and support someone else. But again, none of this matters right now as our country has a traitor in the WH and I think he will try and bomb Iran soon. Last edited by Libertas on Mon Jan 14, 2019 1:06 pm, edited 1 time in total. losing the election is stupid. It's a big tent party, I've got room for Tulsi in our party, I've got room for Jim Webb, I don't have to like Joe Manchin to accept him; we can even spare some centimeters for Lincoln Chafee. It's all good. But, see, that doesn't mean I can't point out who I do or don't want for party leaders, or nominees in primaries. That is a different question. I have demanded unconditional support for the party until the NAZI party and RUSSIANS are out of the WH from myself and I cant imagine anyone not doing that, but if I were to start listing politicians I am in disagreement with it woudl include anyone not for single payer or any number of other social programs we are crazy not to have. But that is lala land, down the road, dreamworld. Does she have any support at all? If she does I've not seen it at all. I wouldn't think she would have any support other than perhaps a few fans who see her as a pretty star to look at. That seems to motivate more than a few. I noticed in her recent photos that she reminded me of the "not a witch" woman who was running for Senate a few years back. Sarah Palin sure was excited by her. Maybe shape and looks wise Gabbard might appeal to star follower conservatives more than liberals because of that. I don't think of star followers as being political people, they've too busy dashing after Kardashians. I would rather they stay home and not vote. She has support from the bros and the JD folks. Cenk Uyger, aka russian agent, and those like him are the ones doing the most damage. too bad, I was a fan of Cenk once, even spoke to him by email once about W...But Cenk has been working for the Kremlin probably since day one. And even if he isnt, MIGHT AS WELL be.